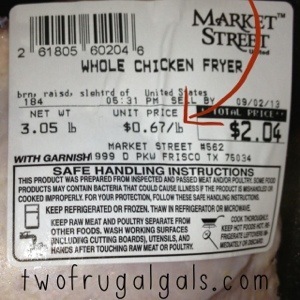 My favorite store had their whole chickens on sale last week for $.67 per lb. I had to stock up! The great thing about boiled chicken meat is it’s called for in many other recipes, and is a wonderful basic recipe to have for many uses. You can make casseroles, wraps, chicken salad, etc… I did some research on the best ways to cook up this gregarious bird and this is what I came up with. 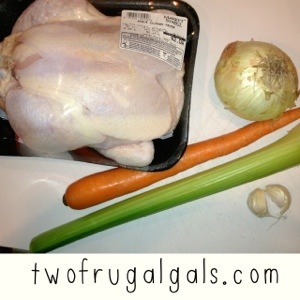 Also, if your looking for tasty ways to use some of this chicken, check out a few of Two Frugal Gals favorite recipes! If your not sure if your getting a good deal on meat, use the unit price to see what the price is per pound. 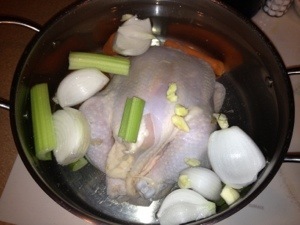 Bring 1 whole chicken and enough water to cover to a boil in a large pot. Add celery, carrots, onion and garlic cloves. Reduce heat; cover and simmer about 40 minutes. 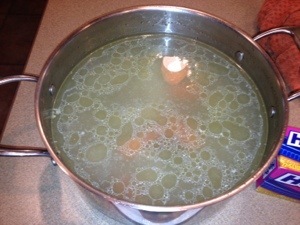 Remove chicken, and discard vegetables, reserving broth. 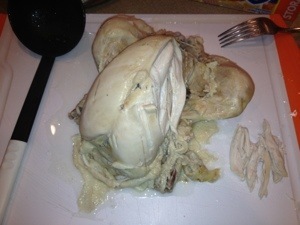 Remove chicken from bones, and shred. Place 2 cups shredded chicken in labeled quart-size freezer bags. Seal and freeze. Strain broth, cool, and refrigerate. Freeze broth in airtight containers or freezer bags for soups and other yummy recipes.